After weeks of relative calm, a weekly protest at the Israel-Gaza border turned deadly Friday when Israeli forces answered arson attacks by firing on demonstrators, killing two Palestinian teenagers, Palestinian and Israeli authorities said. Thousands had gathered at several locations along the Gaza fence, the Israel Defense Forces said, when incendiary balloons were launched toward Israel. The IDF also said some protestors hurled rocks and burning tires in the direction of its soldiers. The soldiers responded with live fire and riot dispersal tactics, according to the IDF. Bilal Mustafa Khafaja, 17, was killed Friday, and Ahmed Misbah Abu Tayour, 16, died later, according to the Palestinian Ministry of Health. The regular Friday protests, which have taken place since March 30, began as the "Great march of Return" by organizers who say their aim is to highlight Palestinians' right to return to land lost to Israeli 70 years ago in the Arab-Israeli War. 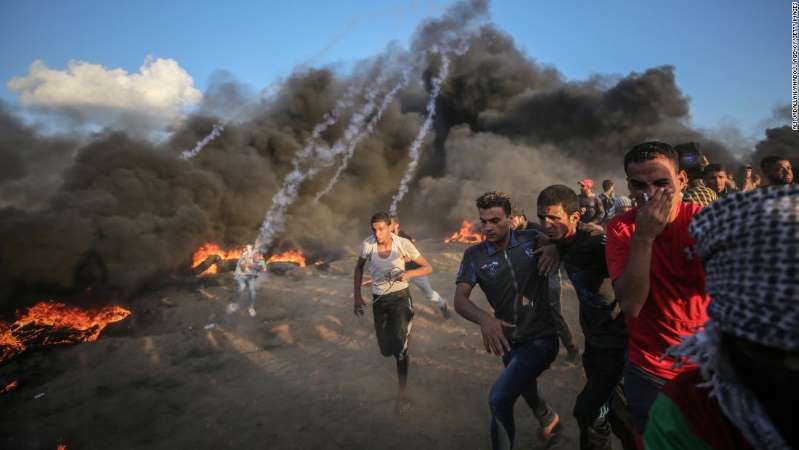 The Palestinian Ministry of Health reports 179 previous Palestinian deaths since the weekly demonstrations began, with more than 19,000 injured. One Israeli has died and 37 have been injured, according to the ministry. Video widely shared on social media appears to show Abu Tayour throwing something, and then jumping up and down with his arms open, before falling to the ground, apparently hit by gunfire. The Palestinian health ministry said one hundred people were injured by IDF live fire in Friday's protest. The IDF said that it was aware of the two fatalities, and that the incidents would be "examined by the relevant chain of command." The IDF also said Saturday it had stopped four Gazans, armed with a knife and an ax, who were trying to cross the fence into Israel.